Ondi Timoner has the rare distinction of being first to win twice the Grand Jury Prize in Documentary Film at the Sundance Film Festival for her features “Dig!” (2004) and “We Live in Public” (2009). 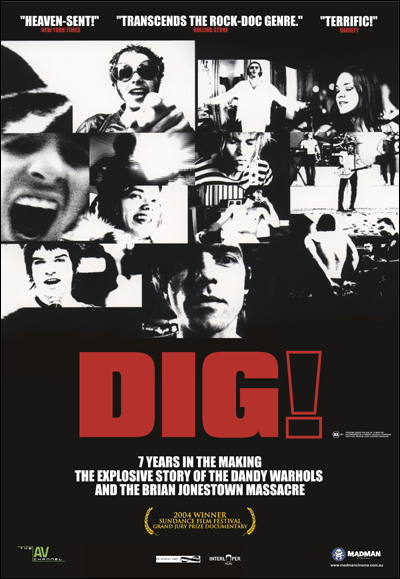 Resulting from seven years and 2,500 hours of footage, “Dig!” focuses on the rivalry between bands, The Dandy Warhols and the Brian Jonestown Massacre. “We Live in Public” profiles internet pioneer Josh Harris and mines the increasing theme of the loss of privacy in the age of the Web. Both were acquired by the Museum of Modern Art, New York City, for their permanent collection. In addition to envisioning, editing, and directing short and feature films, music videos, and commercials through her full-service production company Interloper Films, she is proactive in speaking about storytelling, technology, and art. Among her many projects related to these topics, she founded platform “A Total Disruption” about innovators and entrepreneurs who are taking advantage of technology’s utility and reach to help transform human lives. She hosts podcast “B.Y.O.D. : Bring Your Own Doc” about documentary filmmaking. Furthermore, she directed the opening film—starring Steven Spielberg, Barbra Streisand, Jay-Z, among other icons—for President Clinton’s birthday/fundraiser concert (2011) at the Hollywood Bowl. This film also starred the President himself. Here, Timoner gives her perspective on documentary filmmaking as a powerful way of seeing and expressing, in addition her takes on the current evolution of words, images, and media, as increasingly compelling intersections to move minds and emotions. 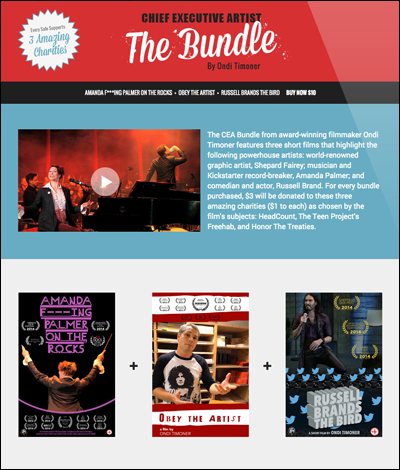 Congratulations on “The Chief Executive Artist Bundle”! What sparked the idea, the vision, for this set, or trilogy, of films? My original inspiration for “A Total Disruption” was the fact that no matter how many films I made or how many awards I won, I felt like I was in a perpetual state of startup. I was like a startup entrepreneur, embarking on a new project every time and needing to sell that project, sell that idea through to make it a reality, figuring out how to scale and distribute it. As the landscape of technology has shifted with the internet, and distribution companies no longer walk away with 15-year contracts, there is a larger degree of transparency. There’s also a greater responsibility that falls to the artist, more control over how the film comes out, how it’s marketed, and more responsibility for the artist to maintain and establish a relationship with the fanbase or audience, and to turn that audience into a family that is a sustainable community. So I’ve learned a lot from the culture of the tech world doing “A Total Disruption.” I wanted to look for artists who I consider to be Chief Executive Artists. The person who runs the company in the tech world is the Chief Executive Officer, CEO. And I really consider myself a Chief Executive Artist, a CEA, someone who really has to wear both hats. I’ve produced and directed every film I’ve ever made, and tried to contribute to not just how it is made and what it says, but how it is perceived in the world. I call it, sort of getting your kid to college. You don’t make the baby and hand it off. You have to raise it, and you have to get it all the way to it’s home. In this case, that’s everyone’s devices—these days in everybody’s living room. Shepard Fairey, Amanda Palmer, and Russell Brand, each in their own disciplines, really demonstrate an incredible ability to use the tools that we all have in our pockets these days and at our disposal, to harness the power of technology and use it to express themselves, and create a path for their own continued freedom as artists, and also to change the world along the way. I’ve made short films about each one to try to inspire other artists, because it takes courage to do these things. Each one of them has faced negative repercussions and challenges because of what they’ve done and the way they do it. But each one continues and the benefits definitely outweigh the hits they’ve had along the way. How much time did it take to complete this cumulative project? I am actually making a feature film about Russell Brand, and as we were beginning development on that, he was heading to Twitter Headquarters to perform there. His Twitter following is immensely loyal and grows by leaps and bounds. In the span of time that I’ve known him, which is a couple of years now, he has gone from 5 million Twitter followers to 9 million Twitter followers. He has almost doubled his millions of followers. He had thousands of followers within seconds of being on the site, and so I thought it would be really interesting to see what his brilliant mind would make of the inner-workings of Twitter. It turned out to be exactly that, and then I did an interview about what this new technology means to him in terms of being able to communicate with his fans. Russell Brand’s film “Russell Brands the Bird” premiered at the Sheffield Doc/Fest in England. Shepard Fairey and I just met randomly, and he asked if he could trade prints for copies of my movies, which was a no brainer deal for me. So I went over to his studio, and we hit it off about this age of disruption that we are lucky enough to live in. He created the logo for “A Total Disruption,” and we turned that into prints, for our Kickstarter, that are signed. We actually have some left, they’re limited-edition Shepard Fairey prints of “A Total Disruption” skull. I loved it, but in the process, I said to him, “I want to make a short film about you. I love the way you go about making your art and putting it out there, the way you work between the virtual medium and the physical medium. Let me follow you in doing a project that maybe is generated on a computer and then turned into a mural”—like he does. So we collaborated on his rendering of an Aaron Huey photograph for Honor the Treaties. He did a 18-foot mural in an alley in Downtown LA, and we followed that process. Shepard Fairey’s “Obey The Artist” ended up premiering at SXSW 2014. It just struck me that all three of these films related to one another. I suppose they’ve all been generated over the last two years. But it’s not like I’ve been working on them full-time over the last two years. I really do believe in short films these days, because I think we all have both limited time and attention span. It’s a great way to just give people a shot of inspiration, a shot of food for thought. Each one sort of exists and has played theatrically in it’s own right, but bundled together, I think they make for a really inspiring, enlightening and entertaining experience. What is the role of the artist in our society’s current iteration? The artist provides the truth behind what is presented by corporate-news entities. Certainly as a documentary filmmaker, I believe we are the people who go deeply into different aspects of our society and doggedly hold fast until we get the story. Whether or not we’re expressing our particular point of view, as I would assume that most good films do have some point of view, you get a chance to really understand the world better, and to understand other people’s perspectives better. Ironically, the deeper you go, the more intimate the portrait, the more universal the result, the more relatable the product. So I can say that, as an artist who works in documentary, I believe that across the board: artists throughout history have always held up a mirror to society. This is no different today. The only difference is we don’t have the same relationship of the gatekeepers that we used to have. Now, artists can speak directly to the world through the Internet. If the thing that they are making is good, and it resonates and is relevant to people’s lives, then the crowd will be appreciative of that and will support the artist. There are all sorts of outlets for this now. I think we are in a time, at least now, where there is a certain freedom of expression that we’ve never witnessed before in history, it’s unprecedented. “The Chief Executive Artist Bundle” affected you? I found the “Chief Executive Artist Bundle” to be everything that I hope it will be to everybody else. Inspiring, enlightening, educational and entertaining. I’ve enjoyed working with all three of these artists. I’ve also worked with other Chief Executive Artists which we’ve created webisodes for, as part of our Chief Executive Artist series, from Austin Kleon, who invented a technique called “Newspaper Blackout Poems” and published a book called “Steal like An Artist,” and uses the Internet as a feedback loop to build his work on a daily basis, to Jhameel, the YouTube pop-star, who is currently a contestant on “American Idol,” to Moby, the musician, who is featured in 10 episodes of “Mondays with Moby.” We have put out hundreds of these episodes with everyone from the founders of Twitter and Instagram to LinkedIn and BitTorrent, and the list goes on and on through “A Total Disruption.” So I just found the entire project to be an incredibly educational and enlightening experience. I am used to making films over the span of 5 to 10 years. As frictionless as filmmaking gets, and as wonderful as feature films can be, they can also be excruciating and take the blood out of you. So I find making short films to be really fun. I plan to put all of my raw footage up into a platform, which is a really pioneering effort as an integral part of “A Total Disruption.” It’s probably the most exciting feature and most difficult to bring into the world. It will go onto a search-and-discovery platform, where you can go through all of the raw footage and search down to a word to get your own first-person wisdom out of the material. You will be able to download the transcripts and eventually remix these interviews into your own empowerment videos or blogs for whatever you need them for. I think this is the future of how we will consume media. As a filmmaker, I believe that we all have to make choices and cut our films down from the hundreds or thousands of hours of footage to less than 2 hours if it is a feature or 15 to 30 minutes long, if it is a short. Obviously most of that footage is left behind, but there is incredible nuggets that just don’t fit the narrative you choose. I would like people to be able to choose their own adventure through my interviews. I think the raw interviews are incredibly inspiring. You can watch them from start to finish, and there is so much that these pioneers and innovators say. I believe all of this should see the light of day, and if this platform works, it will hopefully be a model for the future of non-fiction. I never desired to be a filmmaker—I was going to be the first-woman President of the United States. I was a page in the Senate, and I had to wake up the Senators to vote, and Ted Kennedy was giving speeches to an empty floor. I realized pretty quickly I wasn’t going to make an impact inside that system—it was going to be an exercise in frustration if I pursued politics. Then I wanted to be a musician. I ended up picking up a camera during my junior year of college. I don’t remember why, but I started filming people in toll booths and convenience stores on a road trip. I just asked them what they feared the most or what made them happy. In 1992, a big subject was: “What do you think of gays in the military?” This started all sorts of debates and lively conversation in markets across America. I realized pretty quickly: it was far more interesting to live behind the camera. The camera was really a bridge into worlds I could never otherwise enter. I could talk to people about their feelings as opposed to just walking by them. People wanted to express themselves, and I loved that. I could go and quietly sit at an edit bay and cut that material together. Then I could share what I had found with the world. What really sealed the deal was during my senior year of college when I took a camera into prisons in Connecticut, and I started filming women in prison for a project I called “Voices from Inside Time.” When I would drive past the gates of the prison with the footage, I felt like I was freeing some parts of these women. It felt like I was freeing their souls, their stories, a vital part of their lives—the rest of their lives. They had been buried away from the world; they were shelved away in a parallel universe supported by our tax dollars. They had stories, and if I could share those stories, I could break down the stereotypes of what women in prison were like. Maybe I could inspire more compassion and some changes in the way our justice system is run. That sealed the deal, because it felt like alchemy or magic to me. The people who were graduating from Yale(2) were going to Wall Street, and they asked, “What are you going to do?”, I said, “I am going to be a documentary filmmaker.” They looked at me like I was crazy, they didn’t even know what that meant in 1994. But then again, people weren’t making documentaries during that time. Really, the only people watching documentaries were intellectuals with gray hair. Thankfully, that has changed over the years. David Lynch gave this take on filmmaking: “In film, life-and-death struggles make you sit up, lean forward a little bit. They amplify things happening, in smaller ways, in all of us. These things show up in relationships. They show up in struggles and bring them to a critical point.” What do you work to “amplify” in your films? I always want people to understand the gray area in my films. I want people to understand that heroes aren’t heroes, they’re humans like you. You can do whatever it is you are watching on screen. So if you find something inspiring, my goal is to make it accessible. I want to show the flaws inside it, so people can understand, that no matter how they might feel about themselves and their own limitations, they are capable of accomplishing what it is that they see on that screen. In whatever medium, in whatever way that means to them. I am also interested in having people be more conscious of what they are willing to give up in order to have their lives matter. Of all of our desperate needs, it seems that we want to have a connection with other humans, but we have to realize and be conscious of what we give up to make that happen. 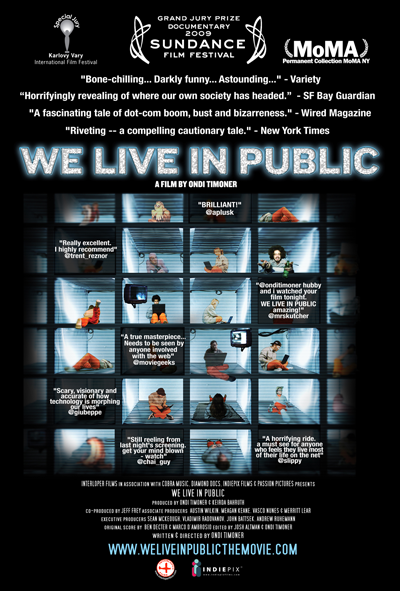 So “We Live in Public” was a real warning shot in that regard. “Join Us” was about mind control and was really looking at our vulnerabilities as humans. I think that by being self-aware of our innate need to want to connect, to be recognized and have our lives matter, we can also be more aware of what we are giving up. There might be vital elements we’ll regret later, whether it’s our privacy, our intimacy, or even the safety of our children or our own lives. With “A Total Disruption,” it’s really an attempt to show the tech world: the inventors and the artists who might seem out of reach from the most humanizing perspective possible. I hope that everyone, who watches “A Total Disruption” and participates in the experiment of our platform, comes out smarter, faster, and together, feels that they are part of an incredibly special time in history. Hopefully, people take advantage of this democratizing opportunity we have, instead of falling into narcissistic traps. If you need further explanation on that, look up my TEDx Talk “When Genius and Insanity Hold Hands.” I talk about the choice we can make right now in this time in history, to go one way or the other. Either herd ourselves into virtual boxes and become enslaved, or to have the ultimate freedom to realize our own vision into reality and affect the world around us. How do you determine an idea to realize? And how do you select the idea and commit to get it done? Many of these ideas come to me from people suggesting that I look into something, or from life just happening. And I collide with these stories. I think that we all do, actually. I just think that I have my antenna up at all times. I am open to what life brings along, and I try to follow signals and serendipity as it happens. I try to walk through the doors that open, even if they are just a crack, I take a peek inside. I’ve been a filmmaker for 22 years, and I have no regrets. My life is so much more interesting from having journeyed in this way. I really believe in it; I think all of us need to shove fear aside. Amanda Palmer and I came up with an expression, “Do Shitism.” You just do it, get involved, just start filming. It might be one day of filming and then you realize, “this doesn’t have the subsistence if it requires to turn into a feature or even a short,” and that is fine. You still have an enriching experience and a deeper exchange than you would have had—had you not gone out the door and done that thing. So that’s kinda how I come across these ideas. What allows me to realize whether it has legs is: “Do I have the access? Are the elements, at least in part, in place? Is there interesting subject matter? Is there an essential question that will resonate with people, that will be additive to their lives?” And if the answer is yes, then I go forth. What primary tools do you use to make a film? A common desire and questions is: How to start? How did you start? What was the first thing you did? What were essential activities/steps taken to start and establish your craft as a filmmaker, and why were these activities/steps important? I have a public access station in New Haven, Connecticut, called Citizens Television (CTV) to thank for my start. CTV opened when I was a student. Yale had no idea that film would be relevant, so they had no production facilities, and all they had were classes on dissecting the Western genre and all this stuff that would yield good cocktail-party conversation but not good films, per say. Now they have a full media center, and I went back there to get an achievement award, and was amazed and astounded. But at that time, it was thanks to a public access station and their shuttling edit system, that my brother, who was two years below me at school, and myself, started there. We’d get three-hour tranches of time on the shuttling system, and if you changed one thing, you had to change everything after it. So my first feature film, “The Nature of the Beast,” unfortunately goes down in quality as the film progresses, because we had to use work tapes and cut them back in from that. Thank God for non-linear editing. I still edit. I just finished editing my new feature film “Brand: A Second Coming.” I edited thousands of hours, so I think if we calculate it, it’s nearly three thousand hours of editing that film since April of last year. Even then, cutting through thousands of hours of footage and being able to try things in different places, without non-linear editing, I wouldn’t have been able to make “Dig!,” “Join Us,” “We Live in Public,” “Cool It,” “Brand: A Second Coming” or probably any of the “Chief Executive Artist” series. So I started at the public access station with my little 8mm camera, regular 8 not even high 8. I took that camera, and she was the star of my first television series on Public Access which was called “High Street 06511,” which was a spoof on “Beverly Hills 90210.” All of my friends played hyperboles of themselves. My camera was called “Flow,” and it was filmed every week, in her apartment. Everyone would come in and meet Flow to work on a project. Sadly, Flow stopped recording to tape in 1998. I threw her off the roof of Capitol Records, and filmed it in 16mm and Super 8 and with video, as she exploded into a million pieces on the ground. That’s part of the music video “Boys Better” for The Dandy Warhols. It’s also part of the opening for “Dig!”, and the biggest parts left of Flow are on the wall in my office. (2) Timoner is a graduate of Yale University. All images courtesy of Ondi Timoner. Big thanks to Kyle Greenberg and Matt Hirsch of independent filmmaking organization BOND/360 for this interviewing opportunity.